Common to many preschool and primary classrooms is a mailbox, as letter writing is one of the early literacy standards. Whether children are writing with letter like forms or forming actual sentences, the act is significant in the process of learning to read and create written form. Furthermore, learning through dramatic play is developmentally appropriate. Children think it is great fun to write letters to their friends, families, and pets, to pretend to be the mailman, and to receive special letters just like in real life. 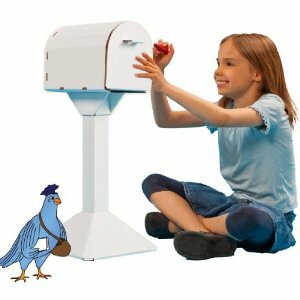 The Everythingland Mailbox by Metamorphic Toys promotes early literacy whether at home or in a classroom. May be colored, painted & decorated with glued on adornments. 100% recyclable & biodegradable. Made using recycled materials. Toy mailbox fit standard mail & is 24″ tall sized for kids 2 – 8 years old. Children can be creative and decorate this recycled cardboard mailbox however they want. “Eco-Art” stickers are included, which are reusable, glue-less and also can be decorated. What makes them “Eco-Art”? Other stickers are made with a silicone coated backing sheet that is non-recyclable and non-biodegradable. Metamorphic Toys offers good green fun with Eco-Art U-Stick’ems! These toys are made in Minnesota. Although I think you can easily make your own cardboard mailbox out of old boxes, children are sometimes more inspired by products that look more realistic like this one. Early literacy activities are so important, and letter writing is becoming a lost art form. Hopefully children playing with the Everything Mailbox will receive more than just bills in their daily mail. Nowali Moccasins Keep Toddler's Feet Warm and They Don't Fall Off!